If you love privacy, afternoon sun, sunsets, stars at night in a forest setting, ocean views, mountains, big sky, eagles, and deer, then this is the place for you. Mayne Island is the most historical of the Gulf Islands situated between Vancouver and Victoria. There are about 1100 full-time residents. Our house was built in 2008 and features glass, wood, granite and slate throughout. A unique feature is the bridge over the living and dining area to a spectacular covered upper deck space with breathtaking views of Active Pass and neighbouring islands. The property affords our guests complete seclusion and privacy nestled in acres of local cedars and firs with unlimited space for your relaxing vacation. It's the ideal place for couples, families, and gatherings of all kinds. 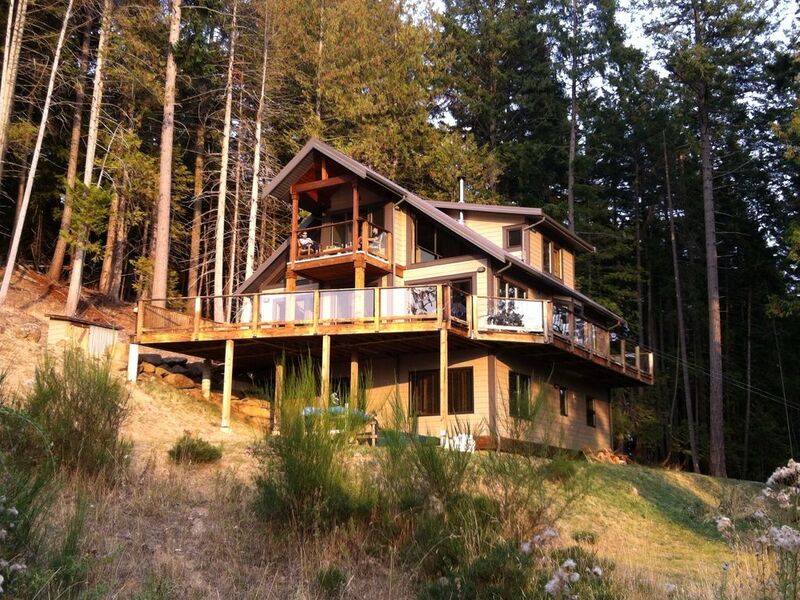 The property has west-facing ocean views of Active Pass and the mountains of Vancouver Island beyond. The vast, expansive surroundings make for a wildlife/bird-watcher's paradise! This property and home have been described by guests as 'Bliss!'. The home's main floor master bedroom features a solid mahogany canopy bed, with private access to the main deck. All three bedrooms are very tastefully decorated and furnished in a west-coast style with forest and ocean views. A picturesque swimming beach is a short bike ride or walk away. Visitors have loved exploring the numerous bays and sandstone caves while their children collect sea shells and play in the sand. Two grocery stores, a wonderful bakery, pub and several restaurants on the island all add to the convenience of the island. Cable TV and Wireless Internet provided. You can get to Mayne Island (Village Bay) by taking a BC Ferry from Victoria (Swartz Bay) or Vancouver (Tsawwassen). See BC Ferries website for schedules for the Southern Gulf Islands. Click on the calendar for up-to-date availability. All three bedrooms have real beds with quality mattresses (3 Queens). For larger groups after the beds are full guests usually bring their own camping mattresses and sleeping bags. Many guests have commented that the house has exceeded their expectations. Please note the site may be showing the nightly rate in US$. Gorgeous and vast west sunset views; watch the boats go through Active Pass. If you love the afternoon sun and western sky in the evening then this is the place for you. We provide linens for the 3 beds. If you have more than 6 people in your group you can bring your own camping mattresses, sleeping bags, pillows etc and find lots of floor space! Stainless appliances, granite counter-tops, slate floor; fully stocked with all small appliances. Spices and numerous other condiments provided. Extensive, diverse video library at the house (over 140 movies). Movie rental outlets on the island nearby. Grassed area with kids tree-fort, see-saw, pic-nic tables. Picnic area up from the house, with picnic table and 2 chaise lounges. Great for a small fire (when fire ban not in effect) under the stars. slippery deck on the tree house. both of our young kids fell down. slippery entrance to the deck on the main deck. only one crazy incident there. Mayne Island is beautiful. People are charming and friendly. I think we love Mayne Island. Ah yes, Fall rain makes things slippery there...we have installed non-slip pads on those decks now so thanks for bringing that to our attention. We had a great time. The situation with the garbage is a hassle. Had to figure out where to take it then that wasn't correct. The last thing I want to do on my vacation is to figure out where to take the garbage and how to deal with it. The rodent situation is a bit much. The front door mat was covered in mouse poop as well as the outside tables. We weren't warned there was a rodent problem until we booked. The location was fabulous, but the poop and trash put a damper on the good time. -yes the little creatures were abundant this year; sorry about your experience with them. After a visit from Old Island Pest Control we are all good! -Garbage pick up available again so no more hassles there either. Beautiful well appointed house with great decks. I love Mayne Island. The house was close to everything. Nice view. Quiet. It really was a very enjoyable and fun weekend. The house was everything and more than we could have hoped for. Lots of amenities, good instructions, comfortable beds, nice cozy wood stove (it was a very wet weekend). Again, it was a great weekend and it is a very warm and welcoming place to stay. Perfect size for our family. The house is beautiful and well appointed. We all slept well in the comfortable beds. Every morning we sat on the large deck watching the deer have breakfast. The pool table was awesome at bringing everyone together as well. Nothing negative to say, wonderful house in a wonderful setting.